My favorite decorative painting supplies. 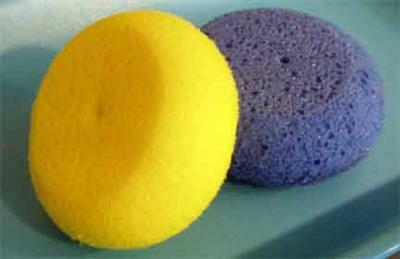 I love my HYDRA SPONGES!!!!!! They're great for basecoating and for varnishing. It makes these tasks so much easier. I use the blue one for varnishing and the yellow one for basecoating. That way I never mix them up. They clean up easily and they're inexpensive too. They also help cut down the wear and tear on my more expensive brushes. For smaller projects I just use a sponge brush. Another inexpensive solution. Comments for My favorite decorative painting supplies. I use my hydra sponges for quickly covering and basecoating very large wood surfaces. So much less tedious than using a paint brush. I like the idea of using 2 different colors for different uses. Great tip! I love my Stay-Wet palette for keeping my paints moist as I paint the day away. It comes in a number of sizes and is great to take along to painting workshops and classes. Another good thing to have by your side is hand sanitizer. The little bit of alcohol in the product really helps to keep the brushes clean as you go. But the best part is that if you need to clean the brush but you need to use it right away for a dry brush technique, the brush dries so much faster! I keep a pump bottle on my work surface at all times. If I can think of something else I'll add another comment later. Join in and write your own page! It's easy to do. How? Simply click here to return to PAINTING SUPPLIES.